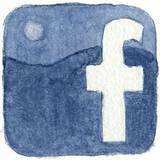 I have heard of this before, but I have never seen it in action. 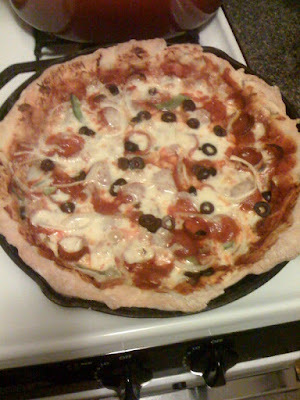 Although I am traditionally a thin crust pizza fan, I have loved a couple of thick crust pizzas in the past. And when a skillet is involved, I am all in. So when I saw a recipe for the dough with butter in it (yes please) on one of my favorite sites (here), I knew it was time to give it a go. To start, put the water in the microwave until it is just warm. 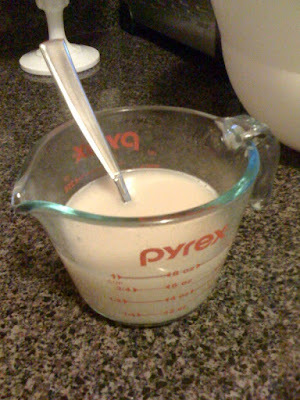 Add the yeast and stir until it dissolves. Add the sugar and stir until it also dissolves, and set aside for about 5 minutes. At this time, you should mix together the flour and salt in a large mixing bowl. In the meantime, throw the butter in the microwave for about 8-10 seconds. You want it to be soft enough to mix well with the dry ingredients, but not to be liquid. When the yeast is activated (about 5 minutes after adding to the water), dump the yeast mixture and the butter into the mixing bowl. If you have a nice mixer, feel free to use it. I just got into it with clean hands and kept turning the dough and mixing it. 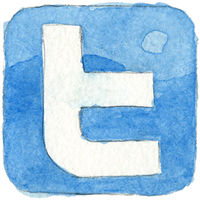 It is really quite easy, and does not take long at all. 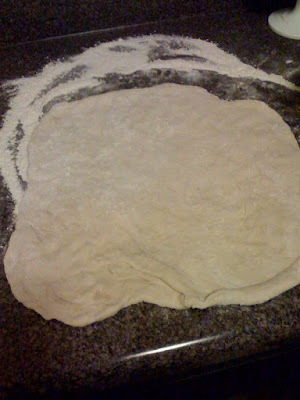 You can add a pinch of flour or water if your dough is too wet or dry. Roll it into a ball and put it in a glass bowl that is rubbed with olive oil. Cover the bowl with a kitchen towel and place it in a warm spot. Now you need to let it your dough rise. Most people say it takes about an hour. I have never found that to be the case. Give this yeasty masterpiece at least an hour and a half to two hours, or make it the night before and leave it in the fridge until you are ready to use it the next day. 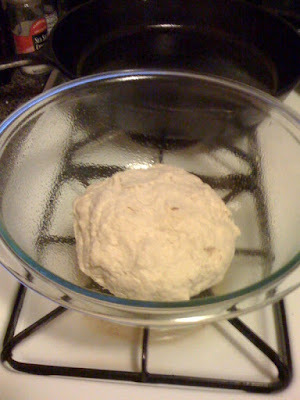 So, now you have your dough that has risen (you DID punch it down halfway through, right?) and you are ready to roll it out or stretch it by hand. Your choice. Throw some flour down and get to it. Unlike its thinner cousins, this is not a huge ordeal. 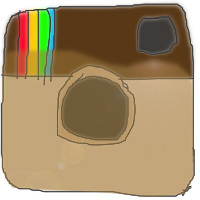 I stretched it by hand in about 30 seconds. 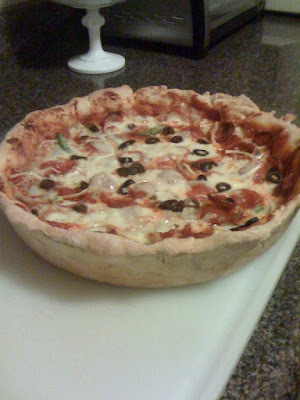 Uniformity is not critical, as this is a deep dish pie. I was also worried about the flour burning inbetween the dough and the skillet, so I just patted it off first and there was no problem. And by no problem, I mean this pizza is absolutely fantastic. You will need to grease the skillet. Well. 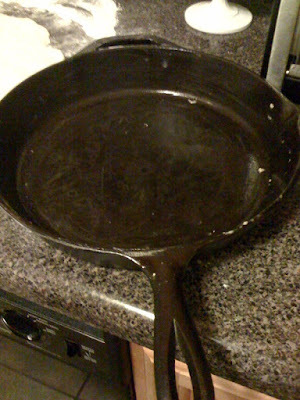 I had an already greased skillet, and then took the extra 1/2T of butter and rubbed it all over skillet. 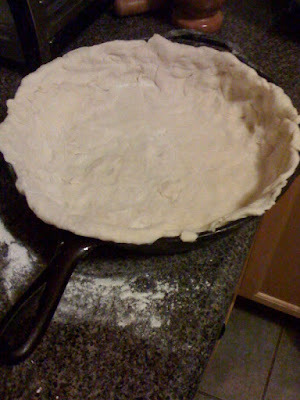 Next, take the dough and place it in the skillet, pressing it around the edges of the pan. 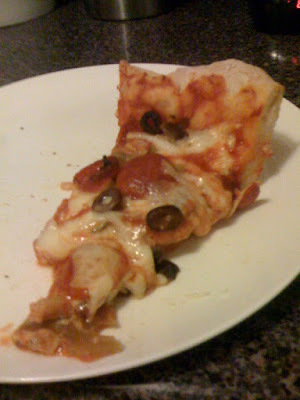 If some pieces are too long, just rip them off and fill in where the dough is thinner. Up next, is the sauce, just give a liberal rub around the base to start. I used organic mushroom marinara. While you were waiting for the dough to rise, you WERE prepping your ingredients, weren't you? 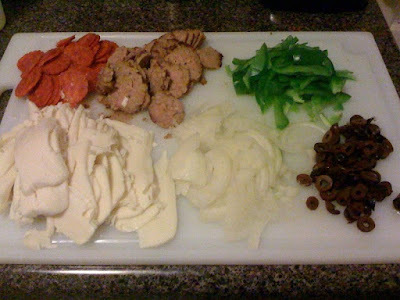 Here I used Italian meatballs (beef, pork, veal), sliced pepperoni, green pepper, thin sliced sweet onion, and kalamata olives. Some sliced mozzarella works really well also. You can use any ingredients you want, and one of the best parts is experimenting. I wanted to go with a (sort of) traditional supreme pizza. 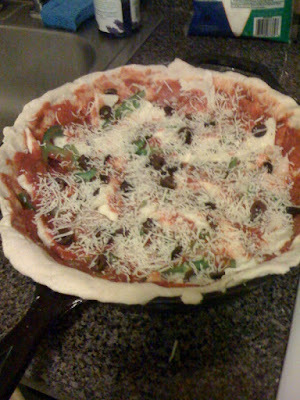 I also threw in some Italian shredded blend cheese in the middle layers, to give a nice cheesy flavor base. 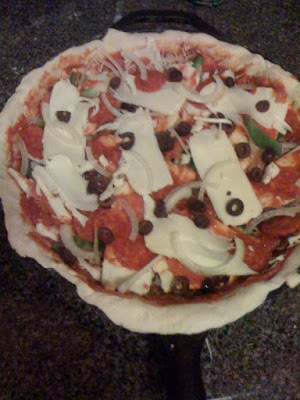 I made three layers and I used a light coat of sauce in between each to help keep it moist. 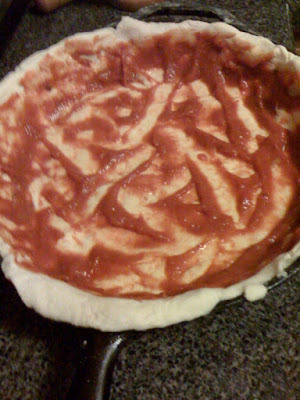 Here is the finished pie before going into the oven. I went light with the onions so as not to over power the flavor. 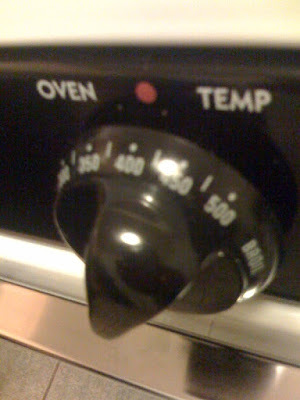 Bake for about 35-45 minutes or until you see the dough pull up from the sides and the toppings start to brown. Let it sit for 5-10 minutes (it will be hard to wait), and then carefully use a spatula and two sets of hands to slide it out of the pan. I was surprised at how easy it was to (carefully!) remove intact. Look at how amazing it looks below! 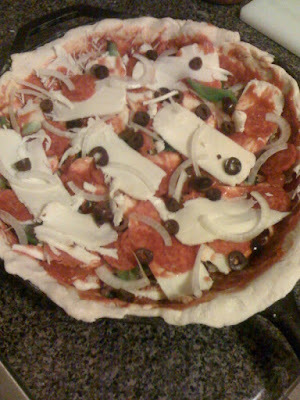 Letting the pizza sit longer will allow the ingredients to set up much better (it looked/tasted great the next day). But, if you are like me, there will be no chance for this pizza to cool. 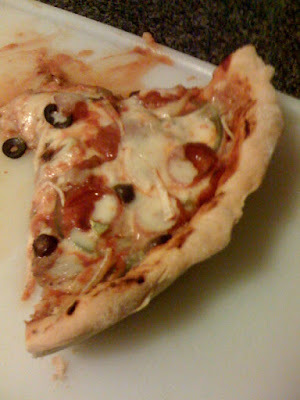 It looked as though it might be fork and knife pizza (casserole) when I first cut it, but it was not at all. 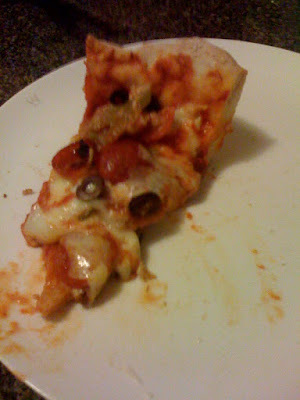 I was able to eat it like a regular slice with no difficulty. I was beyond impressed with the results. 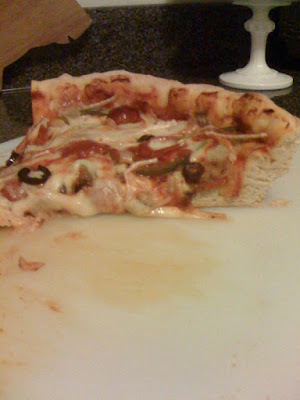 This pizza was awesome. Possibly the best deep dish I have ever had. The crust was light, buttery, flaky and moist. The ingredients mixed perfectly together to create a cheesy, salty, meaty harmony. 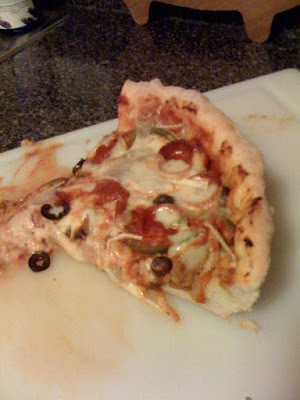 I will definitely make this again soon, and it is SO EASY to pull off. Not to mention, a sure-fire crowd-pleaser.